David Greening is an experienced marine surveyor and has carried out hundreds of marine surveys of sailing yachts and powerboats in the past 15 years. He is a Full Member of the Yacht Designers and Surveyors Association, the Royal Institution of Naval Architects and the British Marine Federation. He has worked in the marine industry for over 35 years and upon completion of a degree in Yacht and Powercraft Design and qualification as a Chartered Engineer, he was employed as a designer and project manager with leading British boatbuilders Bowman Yachts and later with Northshore Yacht Yards. David trained alongside a local marine surveyor before setting up his own Marine Surveying practice near Chichester. 15 years on and now based in Salcombe, he carries out surveys throughout Devon, Cornwall and the South West, mostly in the South Devon harbours and marinas of Plymouth, Newton Ferrers, Totnes, Dartmouth, Noss-on-Dart, Kingswear, Brixham, Torquay as well as Salcombe. Surveys can be completed further afield on request. If you would like a quotation for David Greening to carry out a survey please use the “Get a Quote” link. All surveys are carried out with the benefit of Professional Indemnity and Public Liability Insurance cover in accordance with the Yacht Designers and Surveyors Association member’s scheme. What types of survey do you carry out? If you are buying a boat a Full Pre-Purchase Condition Survey is always recommended. I can offer a Partial Survey by arrangement, the most common being a Structural Survey, which only considers the structural parts of the hull, or an External Hull Survey, which is often referred to as an Osmosis Check. The different types of surveys are outlined in the downloadable “extent of survey” document. Do you carry out Valuations? I can issue a valuation certificate for a small fee but only if I have been instructed to carry out a full inspection of the craft, usually to accompany a Full Condition Survey either for purchase or for insurance. Do you carry out Insurance Surveys? Yes, my qualifications are recognised by all of major marine insurers. I charge slightly less for an Insurance Survey than I do for a Full Pre-Purchase Condition Survey because the reporting is less detailed, though I always hope that there is value in a “fresh pair of eyes” looking at the boat. 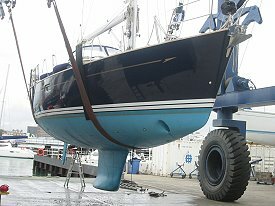 I can only offer this type of report to the existing owner of a craft, although insurance companies will accept a Full Pre-Purchase Condition Survey for a boat that has recently changed hands, I can offer additional discounts for periodic Insurance Surveys if these are booked in advance on a “when you can fit it in” basis. Do you carry out Damage Surveys or Inspections? I often work with leading insurers to complete damage inspections on their behalf in Devon and Cornwall. I offer a prompt service around South Devon and can carry out work in Salcombe at very short notice when required. I can also act as an Owner’s representative or consultant to assist negotiations with insurance companies. It is often worth having an expert at hand particularly when dealing direct with insurance companies. What types of craft do you inspect? I carry out Surveys of sailing yachts and power boats (including RIBS) of up to 60ft, specialising in GRP and FRP structures and smaller timber craft. I work to the Yacht Designers and Surveyors Association standard contract, Terms and Conditions and Limitations. Download here. For a typical 32ft sailing yacht I would expect to be on site for the best part of the day in order to carry out a thorough inspection. For larger craft the inspection often takes longer. The boat is in the water, what is better a “Lift and Hold” or “Blocking Off” ashore? The reality is that most surveys of the underwater surfaces of the hull are carried out in a “Lift and Hold” situation, this can be because it is cheaper and more convenient (especially for the vendor). I can work with this, but require at least 1 hour of unencumbered access to the bottom of the boat for craft up to 35ft LOA and a longer time if bigger. The downside of a “lift and hold” inspection is that if high moisture readings are recorded, osmosis cannot be ruled out, and that if there is an underwater defect, there may be insufficient time to fully investigate. In a perfect world all boats would be blocked off for at least a week prior to the survey to give them a reasonable opportunity to dry out. As my client you are welcome to attend. However sometimes it is better to meet up toward the end of the day on the boat, after I have completed most of my inspection, I can then talk through any issues with the boat at hand. I would absolutely encourage you to attend the haul out in a “Lift and Hold” situation, especially if you have never seen the bottom of the boat. Do you attend sea trials? I am happy to attend sea trials of sailing yachts and powerboats, but because these can often take very different times to complete, depending on the location of the craft etc. I charge on a time basis, unless completed on the day of the inspection. Can you give me a verbal report after the survey? I can telephone or meet with you after the survey to discuss my findings. This should give you a general idea of the condition of the boat; however the written report will go into far more detail and will prioritise the significance of any defects. You would be advised to only act on the written survey report. How long and detailed is the report? Typically my full reports are between 15 and 30 pages. The report will outline the inspection in considerable detail, with a series of full and prioritised recommendations toward the end. The quality of my reports are subject to periodic review by the YDSA. I can provide extracts from previous reports on request, but please understand that the all reports are solely for the use of my clients. How long does it take to complete the survey report? I write all of my survey reports rather than using third parties to do it for me, this ensures that every aspect is given the careful consideration that it deserves. I aim to provide a PDF copy of the report within three working days of completing the inspection. Two hard copies will be in the post by the next day. What support can you give after the Survey Report has been issued? I am more than happy to discuss and advise on any aspect of the report after you have received it. Can you supervise any repair work that is recommended in the survey? Since most of my surveys are carried out locally I can recommend yards and tradesmen and can keep an eye on work on a cost effective basis.